Film Review: "La La Land" (2016). "Here's to the fools who dream." This tribute doesn't grace the screen more beautifully than La La Land. This romantic musical comedy-drama film written and directed by Damien Chazelle. The plot follows the story of Mia, an aspiring actress, and Sebastian, a dedicated jazz musician, who meet and fall in love in LA, when they struggle to make ends meet while pursuing their dreams in a city known for destroying hopes and breaking hearts. With modern day Los Angeles as the backdrop, this musical about everyday life explores what is more important: a once-in-a-lifetime love or the spotlight. 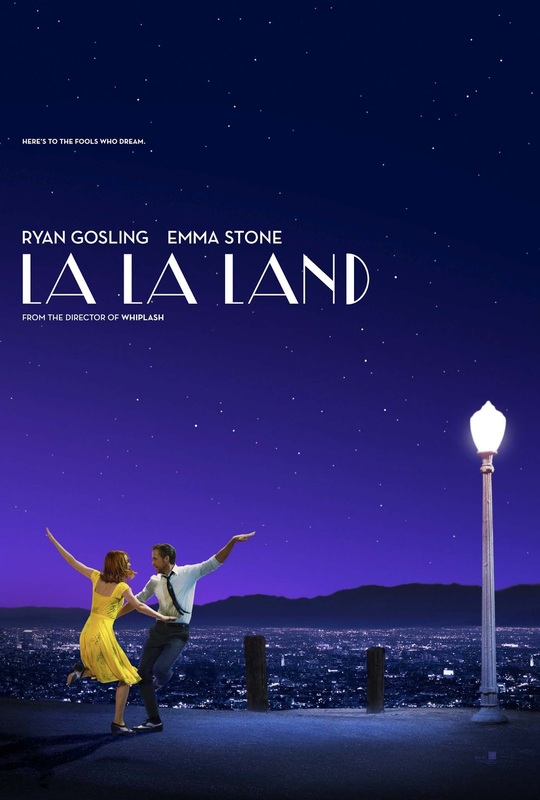 The screenplay for La La Land was first written in 2010 during a period in the director's life when he struggled to get his Hollywood career off the ground. His idea of the film was "to take the old musical but ground it in real life where things don't always exactly work out" and to pay homage and salute people with an unrealistic state of mind who move to Los Angeles to chase their dreams. He first conceived the idea for the film when he was a student at Harvard University along with composer, Justin Hurwitz. After graduating, both Chazelle and Hurwitz moved to Los Angeles in 2010 and continued writing the script but made a few modifications, including altering the location from Boston to LA. The style and tone of the film was inspired by Jacques Demy's The Umbrellas of Cherbourg (1964) and The Young Girls of Rochefort (1967), especially the latter, which was far more dance and jazz oriented, as well as Hollywood musicals such as Singin' in the Rain (1952), Top Hat (1935), Swing Time (1936), The Band Wagon (1953) and even 8 1/2 (1963). However, due to being an original contemporary musical (which was considered an "extinct genre") with no familiar songs to build off a pre-existing fan base, with an unknown crew and no bankable names, Chazelle was unable to obtain studio funding. However, Chazelle persevered and ultimately found funding with producers Fred Berger and Jordan Horowitz. The script then landed at Focus Features, but the studio demanded numerous alterations to the script. Unwilling to make such huge sacrifices to the film's distinctive and pivotal elements, Chazelle scrapped the project and moved on. With the critical and commercial success of Whiplash (2014), as well as sweeping up five Oscar nominations at the 87th Academy Awards, La La Land began to attract attention from studios, and Chazelle resumed his efforts to bring the film to the big screen. Finally, Summit Entertainment and Black Label Media agreed to invest $30 million in the film and distribute it. The project was originally set to star Miles Teller and Emma Watson. However Teller was dropped due to the failure of Fantastic Four (2015) and Watson dropped out to pursue Beauty and the Beast (2017). They were both replaced with Ryan Gosling and Emma Stone. The rest of the cast including J. K. Simmons, Sonoya Mizuno, Finn Wittrock, Rosemarie DeWitt and John Legend, were announced between July and August 2015. Principal photography on the film officially began in August 2015, and concluded in mid-September 2015. Filming took over eight weeks and was shot in more than 60 locations throughout LA, that included downtown trolley, houses in the Hollywood Hills, Angels Flight, Colorado Street Bridge, South Pasadena, Grand Central Market and Watts Tower. Chazelle wanted Los Angeles to be the primary setting for his film, commenting that "there is something very poetic about the city I think, about a city that is built by people with these unrealistic dreams and people who kind of just put it all on the line for that." The Film is presented in Cinemascope using the 2.55:1 aspect ratio, which was the aspect of the first CinemaScope features that only had a 4-track magnetic soundtrack. This later changed to 2.35:1 and 2.39:1 when an optical backup track was added. When projected on a screen in 2.39:1 ratio this feature has small black bars on top and bottom. Because Chazelle wanted to shoot the scene in the tradition of the old musicals without cuts or editing, Gosling, Stone and the cast had to learn to sing, play and dance themselves. Gosling, in particular, learned how to play the piano himself. By the time filming had begun, Gosling was able to play all of the piano sequences seen in the film without the use of a hand double or CGI. Gosling himself had no prior piano training. Chazelle then spent nearly a year with Hurwitz and editor Tom Cross on getting the tone and style just right. The film's score was recorded in the same studio where Singin' In The Rain, The Wizard of Oz, and many other MGM musicals were scored. The film stars Ryan Gosling, Emma Stone and John Legend. The cast gave spectacular and stellar performances and musical numbers. Both Gosling and Stone pulled off show-stopping numbers that silenced my first initial skepticism. Both Gosling and Stone are delights, in their sheer energy and passion of being able to sing, dance and play until they drop. It's astounding. Though Legend brought the best musical number that brought a new vibe to Jazz. La La Land is another mighty fine achievement from Damien Chazelle whose previous film Whiplash was also an astounding piece of work. A fancy package of musical entertainment with wide appeal and bright grossing prospects. For its dramatic passion and sheer energy, the film, along with Arrival, can not be topped by any other film this year. It's one of the shining glories of modern American cinema. It's tough to fight the consensus that this is one of the best films of the year, but what's often lost in the praise is that this also qualifies as a great tribute to bold dreamers who dare to defy the odds in order to chase their dreams. If you've never seen it and don't, you're bonkers. It's mandatory viewing for even the casual moviegoer. Also, see my review for Whiplash. Film Review: "Rogue One: A Star Wars Story" (2016). "Save the Rebellion. Save the dream." This is the story of Rogue One: A Star Wars Story. This epic space opera film directed by Gareth Edwards and written by Chris Weitz and Tony Gilroy, from a story by John Knoll and Gary Whitta. It is the first Star Wars Anthology film, a standalone story set shortly before the events of Star Wars Episode IV: A New Hope (1977). 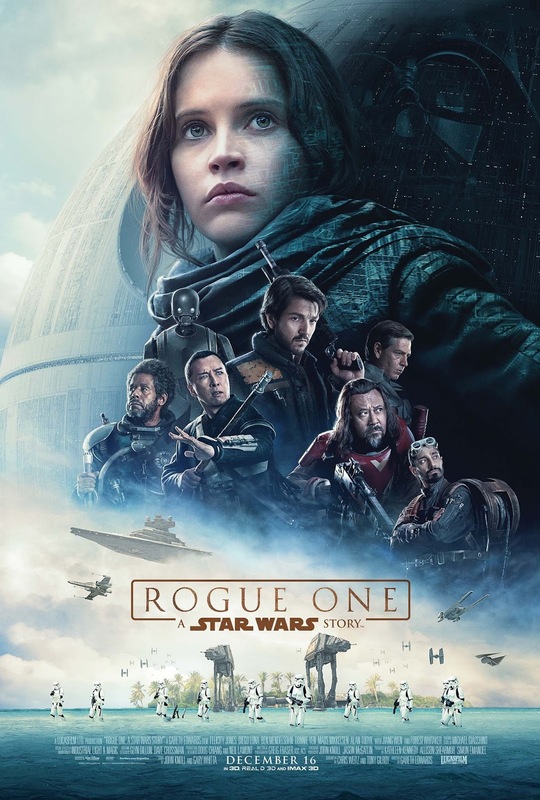 Set between Episode III and IV, the film follows a group of Rebel spies, that includes Rebels, a master swordsman, and non-allied forces led by Jyn Erso, on a mission to steal the design schematics for the Galactic Empire's new superweapon, the Death Star. "It is a period of civil war. Rebel spaceships, striking from a hidden base, have won their first victory against the evil Galactic Empire. During the battle, Rebel spies managed to steal secret plans to the Empire's ultimate weapon, the Death Star, an armored space station with enough power to destroy an entire planet. Pursued by the Empire's sinister agents, Princess Leia races home aboard her starship, custodian of the stolen plans that can save her people and restore freedom to the galaxy..." Ever since 1977, Star Wars fans worldwide have dreamt and pondered about the story of the Rebels who stole the plans to the Death Star explained in the opening crawl. One of them was John Knoll, who became a visual effects supervisor at George Lucas' Industrial Light & Magic. After Disney's purchase of Lucasfilm in 2012, Knoll heard about some of the early concepts for new Star Wars movies and wasn't impressed with any of them. He began developing his idea for this film and was encouraged to finally pitch it to Kathleen Kennedy, the new president of Lucasfilm. She loved the pitch and the movie was put into production. The film was planned to be the first in what is known as the Star Wars Anthology series. Kennedy explained that the stand-alone films will not cross over with the films of the sequel trilogy, stating: "... The canon that he [George Lucas] created was the Star Wars saga... The spin-off movies... they exist within that vast universe that he created..." In May 2014, it was announced that Gareth Edwards would helm the project, with Gary Whitta writing the script, and with Greig Fraser serving as cinematographer. In January 2015, it was announced that Chris Weitz had signed to write the script for the film after Whitta had left the project. In March 2015, the title of the film was revealed to be Rogue One. Edwards stated that the style and tone of the film will be similar to that of a war film, stating, "It's the reality of war. Good guys are bad. Bad guys are good. It's complicated, layered; a very rich scenario in which to set a movie." In January 2015, The Hollywood Reporter stated that Tatiana Maslany, Kate & Rooney Mara were being tested for the film's lead, before Felicity Jones won the role in March. At the same time, Aaron Paul, Edgar Ramírez and Sam Claflin were eyed for the male lead role, which Diego Luna ultimately won the role in May. Joel Edgerton, Dominic West, Mark Strong, Taylor Kitsch, Joel Kinnaman, Sam Worthington, Charlie Hunnam, and Gerard Butler were rumored to join the film. In May, Ben Mendelsohn and Riz Ahmed were added to the cast. In June, Forest Whitaker was cast. Former Star Wars actors James Earl Jones, Genevieve O'Reilly and Jimmy Smits were all confirmed to reprise their roles of Darth Vader, Mon Mothma and Bail Organa, making it their first appearance since Star Wars Episode III: Revenge of the Sith (2005). Principal photography on the film began in August 2015 and wrapped in February 2016. Locations included Elstree Studios in Hertfordshire, London, Laamu Atoll in the Maldives, Iceland and Jordan. The film was shot with digital Arri Alexa 65 cameras using Ultra Panavision 70 lenses. In February 2016, Disney executives stated that the film was "virtually completed". However, in June 2016, Several weeks of pre-scheduled reshoots began. In August 2016, The Hollywood Reporter confirmed that Tony Gilroy had spearheaded the reshoots, in lieu of Edwards, and that Gilroy would have just as much say in the final cut of the film as Edwards. Gilroy was initially brought on in order to retool the ending of the film, which was not coming together as hoped, under Edwards' direction. Post-production wrapped on November 28, 2016. In March 2015, it was reported that Alexandre Desplat, who worked with Edwards on the Godzilla reboot, was brought on to compose the score for the film. However, in September 2016, it was announced that Michael Giacchino would be replacing Desplat as composer, after the film's reshoots altered the post-production schedule and reportedly left Desplat no longer available. Giacchino only had four and a half weeks to compose the music for the film, beginning almost immediately after finishing production on Doctor Strange. The film stars Felicity Jones, Diego Luna, Ben Mendelsohn, Donnie Yen, Mads Mikkelsen, Alan Tudyk, Riz Ahmed, Jiang Wen, and Forest Whitaker. The cast gave terrific performances, giving each character their own unique personalities that will join the ever-expanding plethora of Star Wars Characters. With enough novelty to create yet another cohort of die-hard fans, Rogue One: A Star Wars Story strikes all the right chords to feel both familiar and exhilaratingly new. The film is a visually gorgeous, thrilling, joyous, surprising, and heart-thumping adventure. It had sufficient style, momentum, love and care to prove itself irresistible. The film's main strength was that it pulled off a delicate balancing act, paying thoughtful homage to the past. From the old joys to fresh twists, this is a unique blockbuster experience that celebrates the franchise whilst also expanding it. The film may be slightly derivative, but it is a delight nonetheless. It is bound to be a film experience long remembered by fans and non-fans alike. Also, see my reviews for Godzilla and Star Wars: The Force Awakens. 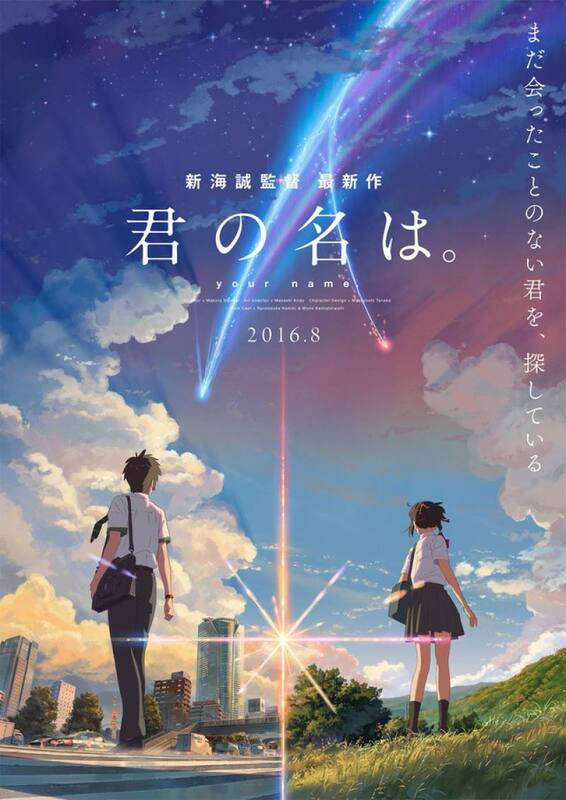 Film Review: "Your Name" ("君の名は") (2016). "Treasure the experience. Dreams fade away after you wake up." This is the underlying heart and soul of Your Name (君の名は). This Japanese fantasy anime film written and directed by Makoto Shinkai, based on Shinkai's novel of the same name. The film is centred on the fate and the hearts of two young high-schoolers, Mitsuha and Taki, who are complete strangers living separate lives. But one night, they suddenly switch places. This bizarre occurrence continues to happen randomly, and the two must adjust their lives around each other. When a dazzling comet lights up the night's sky, something shifts, and they seek each other out wanting something more - a chance to finally meet. But try as they might, something more daunting than distance prevents them. Taking inspiration from works such as Shūzō Oshimi's Inside Mari, Ranma ½, the Heian period novel Torikaebaya Monogatari, and Greg Egan's short story The Safe-Deposit Box, as well as the Great Eastern Earthquake of Japan in 2011, Shinkai's novel had proven to be a success, which sold around 1,029,000 copies. It was inevitable that a feature film adaptation was to come to fruition. While the town of Itamori is fictional, the film drew inspirations from real-life locations such as the city of Hida in the Gifu Prefecture and its library, Hida City Library. Behind one of the film's strongest contributions, Shinkai had requested Noda Yojiro, the vocalist of the Japanese rock band Radwimps, to compose its music "in a way that the music will (supplement) the dialogue or monologue of the characters". The film features the voice talents of Ryunosuke Kamiki, Mone Kamishiraishi, Masami Nagasawa, Etsuko Ichihara and Aoi Yūki. Like all of Shinkai's works, characters are always at the heart of his films. Shinkai has once again brought out dynamic characterisations and performances from his cast. The important thing is that the film never dictates how you should feel towards the characters. In addition, between the interactions and the dialogue exchanges between each character, everything is as clear as night and day. Your Name is an astonishing film that truly feels like the culmination of Shinkai’s entire career up until this point. It is quite simply his crowning achievement. By any standard it's an impressive anime; but the fact that it is only his fifth outing, it's remarkable. This is perhaps the most important anime film of the new millennium. I suspect that in 10 years, film buffs worldwide will be pointing to this film as the mandatory must-see. It is here one can see why Shinkai is hailed as "the next Miyazaki". One thing's for sure, like Miyazaki, Shinkai has the ability to pierce the veil of the everyday to reveal a poignant, evanescent beauty most of us notice only in rare moments. The film's score by Radwimps is heartbreakingly perfect and very much contributes to the success of the film. In the end, the film is a supreme and a magical anime offering. "Find your happy place". This is at the heart of Trolls. This computer-animated musical comedy film, directed by Mike Mitchell and Walt Dohrn, written by Jonathan Aibel and Glenn Berger, based on a story by Erica Rivinoja and based on the dolls of the same name created by Thomas Dam. The film revolves around two trolls, Poppy, the happiest Troll ever born, and the curmudgeonly Branch, as they set off on a quest to rescue her friends after the Bergens invade Troll Village. Trolls, more or less its original form, originated from Gjøl in Denmark. In 1958, the famous troll doll toy was created by Thomas Dam. The first iterations were filled with wood shavings and many styles followed since. Plans for a film based on the toyline to be produced by DreamWorks were announced as early as 2010. This version was to be written by Adam Wilson and his wife Melanie. By 2012, Chloë Grace Moretz and Jason Schwartzman were reported to have been cast in the lead roles. In the same year, 20th Century Fox and DreamWorks Animation announced that the film with the working title Trolls would be released in June 2015, with Anand Tucker set to direct the film, and Wallace Wolodarsky and Maya Forbes to pen the script. 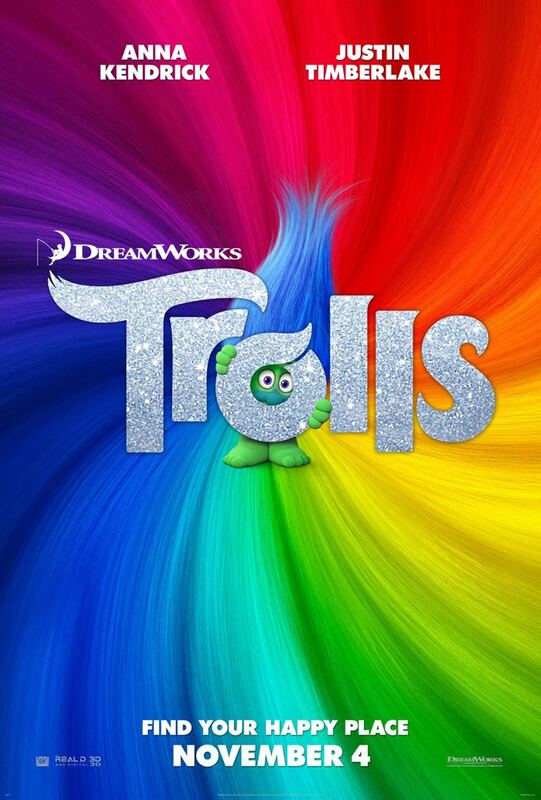 By April 2013, DreamWorks Animation had acquired the intellectual property for the Trolls franchise from the Dam Family and Dam Things, thus turning DreamWorks Animation into the exclusive worldwide licensor of the merchandise rights, except for Scandinavia. In May 2013, the film was pushed back for a year to November 2016. The same month, DreamWorks Animation announced that Mike Mitchell and Erica Rivinoja had replaced Tucker, Wolodarksy and Forbes as director and writer, and were hired to reimagine the film as a musical comedy. This would make the film DreamWorks Animation's first musical film since The Prince of Egypt (1998). By January 2016, Anna Kendrick, Justin Timberlake and the rest of the cast had all confirmed their casting and had announced their respective roles via announcements on Twitter. The film features the voices of Anna Kendrick, Justin Timberlake, Zooey Deschanel, Russell Brand, James Corden, and Gwen Stefani. The cast gave enjoyable performances, even though their characters are nothing more than archetypal, which unfortunately is expected in animated films. Kendrick, Timberlake and Deschanel gave unique covers of The Sound of Silence, True Colours and Hello, even though they didn't live up to the originals. Like most modern animated movies, Trolls is lovely to look at; unfortunately, there isn't much going on beneath the surface. Factors such as cliched storyline, combined with painfully small doses of laughs and a rather weak plethora of cover versions to great songs, makes the film perhaps not one of DreamWorks' best animated features. The film is merely a distended cartoon meant to plug a fashionable line of children's dolls. However, unlike modern Disney films, there is something in this film that will move both young and old audiences, and, at times, does manage to enchant you with its oddball charm.